Pssst! 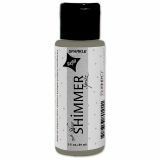 Sheer Shimmer Spritz Refill 2oz - TSUKINEKO-Psst! Shimmer Spritz Refill. Add a little shimmer to your craft projects! Also perfect for applying to floral arrangements for a delicate shimmer. This package contains one 2fl. oz refill bottle of Psst! Shimmer Spritz. Available in a variety of colors: each sold separately. Spritzer not included. Conforms to ASTM D4236. Made in USA.